Free breakfast complimentary Wi-Fi access an outdoor pool and rooms decked out with microwaves and mini-fridges make the Holiday Inn Express and Suites Bossier City Northeast a comfortable place to unwind. The four-story Holiday Inn offers 87 rooms with coffeemakers microwaves and mini-fridges - almost like having a small kitchen in your room. Stay connected with free Wi-Fi and enjoy a daily complimentary breakfast. Non-smoking rooms are available.The outdoor pool is welcome on a hot day and the fitness center is open around the clock. Guests can use the computer in the business center which offers copy and fax services. Parking is free. 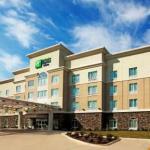 The hotel is located off I-220 across the street from Louisiana Downs Race Track and Casino. Downtown Shreveport the Louisiana Boardwalk and the Shreveport Convention Center are 10 miles away. Hungry guests are within walking distance of several restaurants. Barksdale Air Force Base is five miles from the hotel. The Pierre Bossier Mall is five minutes away and there are at least six major casinos within 10 minutes. The hotel is 15 miles from Shreveport Regional Airport.